As I put together the Marinated Cauliflower, Olive, and Caper Salad, it reminded me a lot of the kind of olive salad that’s usually on a muffuletta. The only problem for me with a standard muffuletta is that it’s usually filled with several varieties of salami and ham which all fall into the red meat category that I avoid. So, I thought, why not build a vegetarian muffuletta? I skipped the meat and sliced roasted portobellos to take its place and added a layer of piquillo peppers. I chopped the Marinated Cauliflower Salad to a smaller size before adding a generous portion to the sandwich. Just as a muffuletta should be, this was a piled-high sandwich with big flavors. I’m not sure if this version will catch on in New Orleans, but it was hit at my house for Mardi Gras. I started with ciabatta rolls which were sliced, brushed with olive oil and toasted. From the bottom up, I layered arugula leaves, sliced provolone, roasted and sliced portobellos, and piquillo peppers. Of course, any roasted red pepper would add good color and flavor, but I had some piquillos on hand. Next up, I chopped some pepperoncini which were added before the chopped cauliflower salad. A little more arugula sat on top, and that was the sandwich. I love how the dressing from the cauliflower salad and the brine from the pepperoncini seep into the crunchy, toasted bread and flavor the whole sandwich. And, it’s a sandwich that requires a napkin or two to be served with it, but that’s part of the charm of a muffuletta. Mardi Gras inspired this creation, but from now on, it will make year-round appearances in our sandwich rotation. great sandwich, I think adding roasted portobellos makes it ultra special! Fabulous. I am drooling, esp bc my lunch was disappointing. Well done. This looks really delicious! I love all the colors and flavors packed into this sandwich. This has got to be one of the cutest and prettiest burgers I have seen, and I love that it is meatless at that too! I was wondering what muffuletta was when I read the title but love your version of this vegetarian sandwich as I also try and avoid red meat as much as I can. Lisa, this is too good! I loved this vegetarian recipe and the picture looks delishhh! Thanks for sharing this. LOVE it. I used to enjoy a good muffuletta before I became a vegetarian, but I've never thought of vegetarian-izing it. I have never heard of or had a muffuletta...it sure looks very tempting! What a great way of spinning this for vegetarians or a meatless Monday. These flavors are so bright and zippy I bet they would satisfy the biggest meat lover. Nicely done! I love the cut through slice showing all the ingredients. It looks very wholesome. My husband would love the version of a Muffuletta! 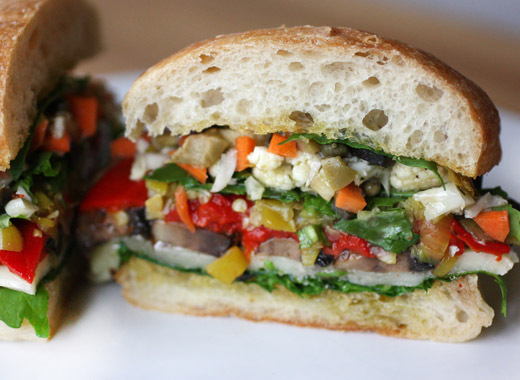 A marvelous combination of flavors in a vegetarian sandwich! This is a great idea. I'm not a fan of meat loaded sandwiches either. This is right up my alley with all the delicious veggies. I've been out of the loop lately but it looks like you've been busy in the kitchen. Love the idea and ingredients in this vegetarian muffaleta. While I love the original, it can be a bit of a meat overload. Although I love a regular muffuletta, I can never eat a whole one. 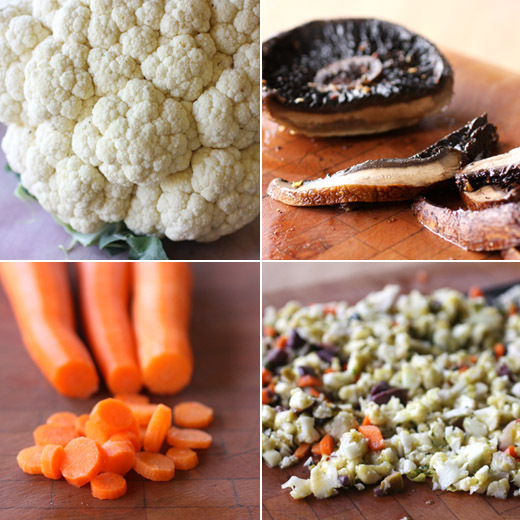 This looks so much lighter, and the portobello would add super flavor and texture. Really a great idea - and one I'll probably borrow someday! Thanks for this. 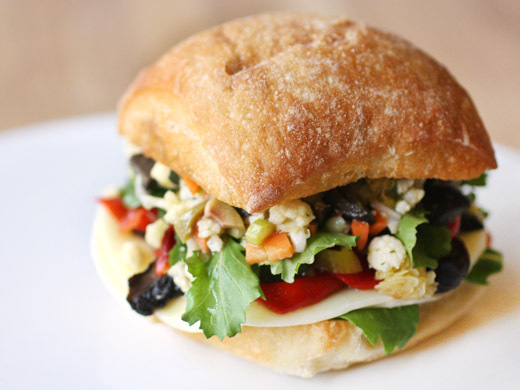 Your vegetarian muffuletta looks and sounds wonderful. I love the colors! After seeing your vegetarian muffuletta, I think I can convert my regular one to your version. Great idea Lisa. Sounds positively delightful! I would go for this healthy version over the cold cut version in a HEART beat! Not only I like that this is meatless, I also love the many vegetables (and colors) you have used. To me, just so naturally fresh, healthy, nutritious and delicious.